Yesterday I rolled out of bed (I literally do roll out of bed btw) at 5:30 and hit the treadmill for a very leisure 45 minute walk while reading a book and drinking a cup of coffee. Doesn’t that sound nice? It really was. It would be even nicer it I were outside on the beach with the warm sun on my back…ahh less than one month. Wednesday was day two of my personal “get creative with breakfast” movement. The evening before last, I combined kefir, frozen blueberries, frozen strawberries, chia seeds, chocolate egg white protein powder, and a touch of honey. I gave it a good stir, covered it, and let it sit in the fridge overnight. 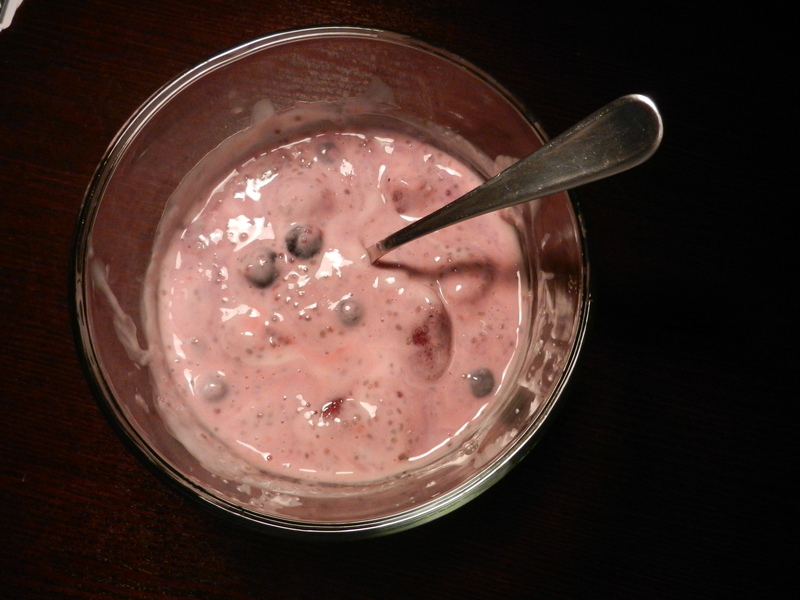 In the morning I had a refreshingly sweet yet slightly tart chia berry kefir bowl! For those of you new to kefir, join the club. This is my first week of experimenting with it. Kefir is a fermented milk product. It has the consistency of really thin yogurt and has a tangy flavor. It is a probiotic which has been show to help improve intestinal health by creating a healthy balance of bacteria in the gut and can improve digestion. I bought the plain version to try out but they have flavored versions at the stores now too. As I mentioned in my previous post, I am all about natural ways to stay and get healthy, and after talking about the possibility of adding fermented foods to my diet with my chiropractor, I decided to give it a go. 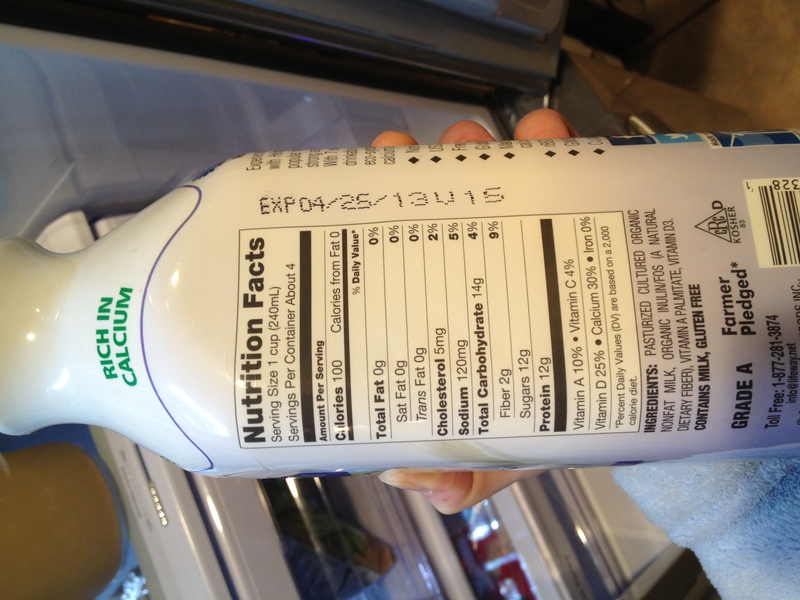 Here’s a link to more info if you are interested: kefir info. It is 99% lactose free and gluten-free, a good source of vitamin D and calcium, has 12 grams of protein per cup, and only natural sugars. Sold. Lunch was a hodge-podge of all things—chicken with marinara and cheese, sugar snap peas, carrots, and an apple. I had an afternoon snack of a banana and a clementine. For dinner I was not in a cooking mood at all but was getting pretty hungry. We were running low on veggies so that was making my dinner decision even more challenging. Then I spotted the sweet potato on the counter that I had bought last weekend and the decision was made. I wanted to experiment with it to see how my body reacted to a more “starchy” vegetable and I really do like sweet potatoes. I made it the cheater way in the microwave. After scrubbing it down, I poked a bunch of holes into it, placed it on a microwave safe plate and cooked it for 3 minutes on one side, and then 3 minutes on the other. 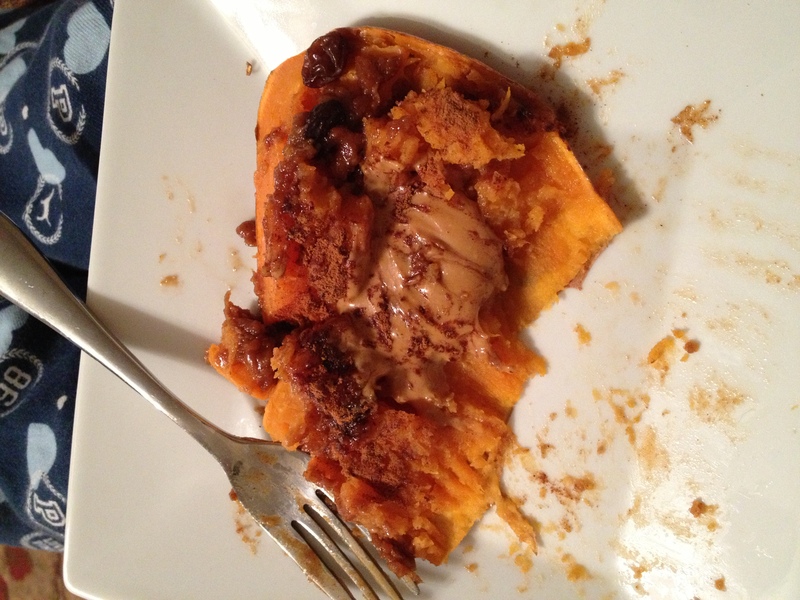 This was a monster of a sweet potato, so I cut it in half and saved one half for another day. I added cinnamon, honey, peanut butter and raisins, and dug right in. 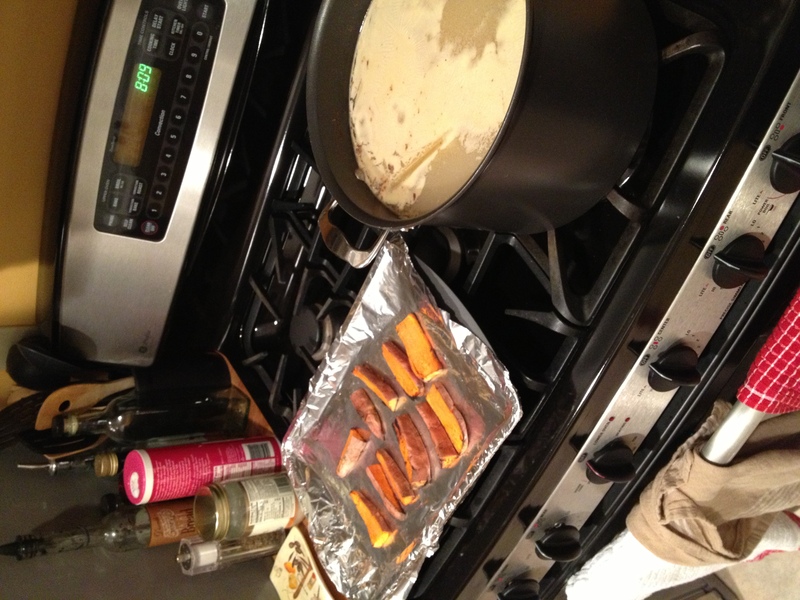 I broiled the second half of the sweet potato in wedges to crisp them up, and refrigerated them for another day. I also finished cooking the bone broth–it needs to simmer for 24 hours to leach the maximum amount of calcium from the bones into the broth. 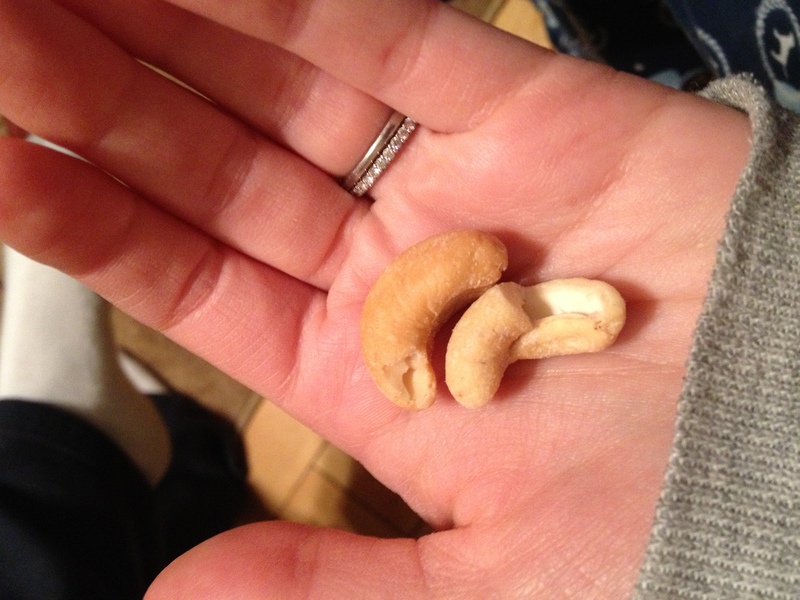 For a snack later in the evening I ate a few dates and had a couple small handfuls of cashews. Dana and I sealed the grout lines in the tile in the laundry room last night. Once it was dry we moved the washer and dryer back into place. We haven’t been able to do laundry since last week and I haven’t miss it at all. It is so exciting seeing the room come together. Next we will be finishing painting the shelves, assembling them, and moving storage bins in! We’re coming along! Don’t forget, once it’s ALL finished I will be sharing photos. Have a happy day friends! xoxo! 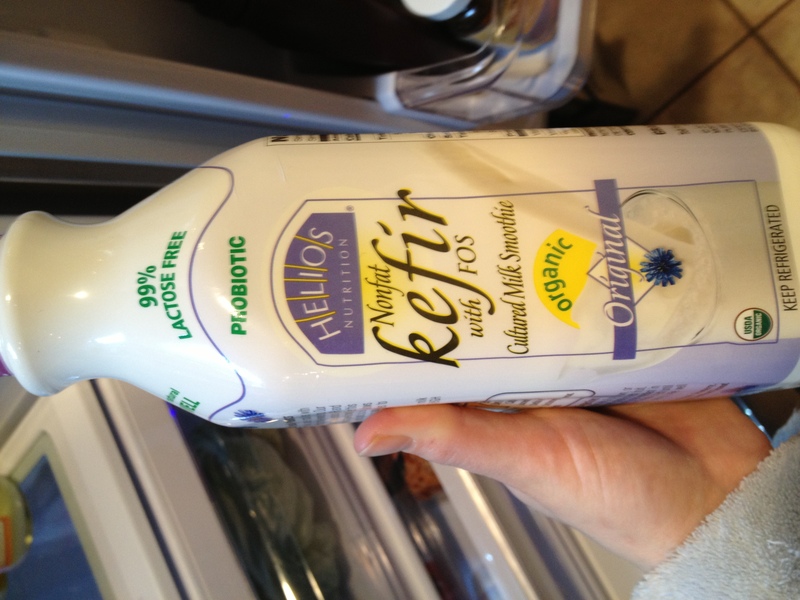 Question of the day: What are your thoughts/experiences on kefir and other fermented foods?